Not all buildings in the city need be ostentatious and very often simplicity and understatement can be very effective. This 18-story building is an excellent example of a low-key building that has enough finesse to be quite distinguished. On a fairly steep slope, but Manhattan standards, at the base of Carnegie Hill, this building has a three-story limestone base on the cross-street and a very attractive, high-end storefront faced with polished green granite at the corner. The buildings canopied entrance is on 86th Street. The lobby is tall and rather spartan, but quite elegant, with the elevators around a corner of the lobby. The buildings facade above the limestone base is a dark brown brick that is very handsome and has aged well. There are no balconies and except for the top few floors no setbacks. The top of the building, however, is asymmetrical with some angles and a tall, slab chimney. The building conjures the image of a tall, dapper gentleman with a slightly cocked hat in a conservative brown suit wearing spats, the proper sort who might be found in a novel by Louis Auchincloss, who was a resident on a high floor in the building for a while. The 48-unit building, which was erected in 1931 and converted to a cooperative in 1967, is one of several Art Deco structures along Madison Avenue in the 80s, although its decorative embellishment is quite minimal. 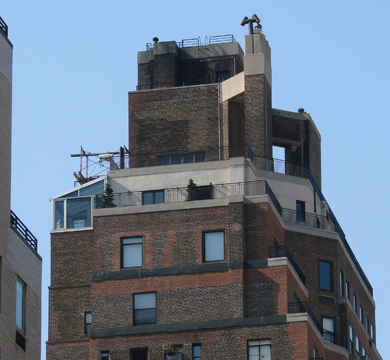 The building, which is a bit taller than most in the area, has good views down Madison Avenue because the building directly across 86th Street is only two-stories tall. It has sidewalk landscaping, a canopied, one-stepup entrance and a doorman, but no garage and no sundeck. 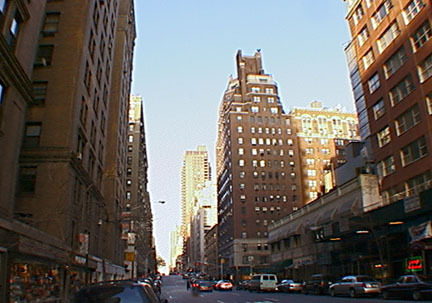 The building's entrance is at a crosstown-bus stop and an express subway station is two blocks to the east. The top of the building has two buttress-like openings and it appears that a large oculus was filled in on the south facade.